Cover potato cubes with water in a large saucepan. Add 2 teaspoons salt. Bring to a boil, then reduce heat to a simmer and continue to cook until potatos are fork tender. Drain and cool. 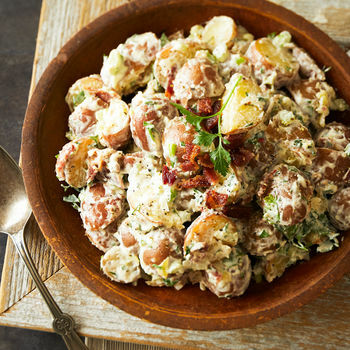 Combine potatoes, Horseradish Peppercorn Grille Sauce, scallions, celery, bacon, parsley, dill, and garlic. Toss and season to taste with salt and pepper. Serve at room temperature. May be refrigerated 1-2 days (may need to add a little more dressing after storage).